Ellie Goulding has headlined her Streets of London gig, joined by some of pop’s biggest names. Dua Lipa, Clean Bandit and Olly Alexander from Years & Years joined the singer to raise money for the charity, which supports homeless people in the capital. 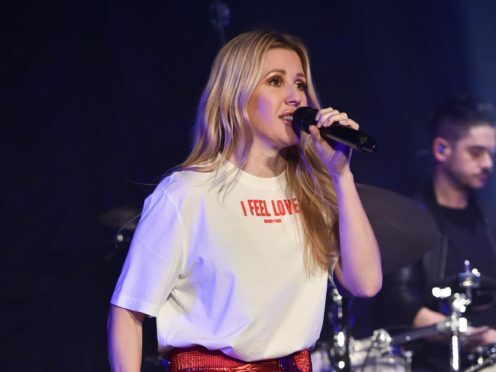 Goulding, 31, took to the stage of the SSE Arena in Wembley in high-waisted burgundy joggers and a T-shirt emblazoned with the slogan I Feel Love. She completed the ensemble with a pair of white high-top trainers. Clean Bandit also graced the stage of the 12,500-capacity venue. The EDM and Latino pop titans played a selection of their string-laden hits. Lead singer and violinist Grace Chatto, 33, wore a white crop top, which she paired with glittering trousers. London-born, Kosovo-raised Dua Lipa, 23, was another chart-topping name on the line-up. She took to the stage in a lacy black mini-dress, which she complemented with statement earrings and red painted nails. Goulding’s support for Streets of London began when she played a fundraising show at Shepherd’s Bush Empire in December 2014. Since then her annual events have raised more than £300,000.